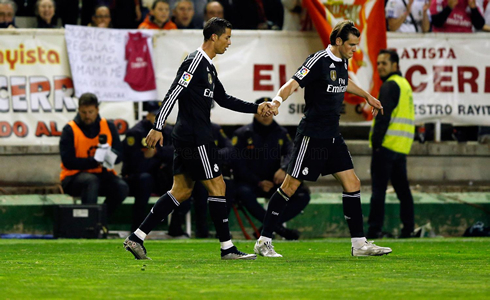 ﻿ Rayo Vallecano 0-2 Real Madrid. Still on the chase! 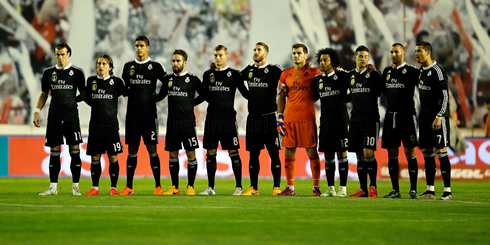 08.04.2015 » Rayo Vallecano 0-2 Real Madrid. Still on the chase! 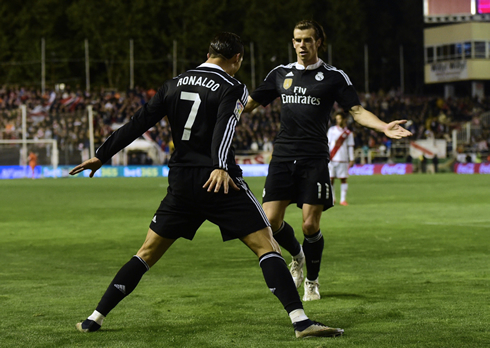 Real Madrid were pressured to win tonight's game against Rayo Vallecano and they got the 3 points after turning up a notch in the second half of the tie. Cristiano Ronaldo with a header and James Rodríguez with a nice strike, made sure the Merengues will remain 4 points behind Barcelona on the top of the league. 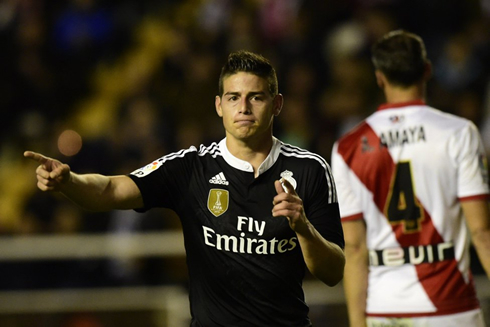 Real Madrid secured the 3 points in their visit to the Vallecas stadium this Wednesday night, after beating Rayo Vallecano 0-2 thanks to goals from Cristiano Ronaldo and James Rodríguez. It's been far from an easy game though and Carlo Ancelotti's men only managed to take matters into their own hands in the last 45 minutes of the game. The hosts created a lot of trouble to Real Madrid and it's no surprise that we've ended up seeing them finishing the game with more overall possession than Los Blancos. With Barça's 4-0 win earlier today against Almeria, there was no margin for error if Madrid were serious about keeping the chase to their archrivals on the top of La Liga. The first half of tonight's game showed us a bossy Rayo Vallecano side, basically calling the shots and dictating the pace of the game in their own stadium. The hosts were better in the center of the pitch and created several dangerous plays mostly through Embarba, who kept exploring the left wing. Dani Carvajal had his hands full during these first 45 minutes, which naturally also kept him out of the other third of the field. The Merengues were pretty much shut down in the first half and Carlo Ancelotti certainly knew that something had to change after the break if his side was still expecting to get the 3 points from this game and by doing that, also keeping the pressure on Barcelona. Fortunately, that half-time talk seems to have had the desired effect and Real Madrid started playing better football right after the team came out from the locker rooms. In the 68th minute, Carvajal finally got to go down the line and send a perfect weighed cross to Cristiano Ronaldo. The Portuguese striker, who had been mistakenly booked minutes earlier for an alleged dive inside Rayo's box, finally set things straight and headed the ball into the back of the net, scoring his 12th header of the season. However, that yellow card Ronaldo was shown in the 51st minute will force him to sit out from this Saturday's home fixture against Eibar. It would have been a good chance for Ronaldo to keep his goalscoring vein active, just a few days before the first UEFA Champions League quarter-finals clash against Atletico Madrid, scheduled for next Tuesday (April 14). Six minutes after the deadlock got broken by Ronaldo, it would be James Rodríguez adding a second and seeing his name back in the scoresheet after coming back from injury. 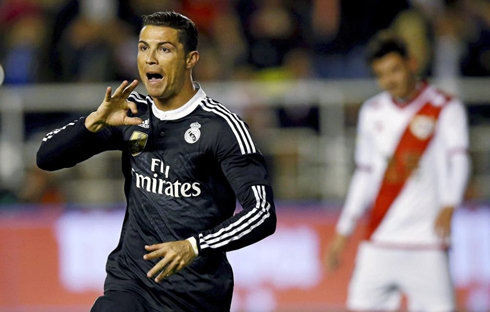 The Colombian picked up a pass from Ronaldo when he was about to step in inside Rayo Vallecano's box and from a central position, he curled the ball to the left and granted Real Madrid a more comfortable lead. There are now 8 fixtures left in La Liga and both Barcelona and Real Madrid are well aware that they are on a sprint for the finish line. Next Saturday could be particularly interesting, since not only Barcelona are going on a tough trip to Sevilla, but Real Madrid will also have to host Eibar deprived of Gareth Bale and Cristiano Ronaldo, both suspended due to yellow-card accumulation. Attackers: Cristiano Ronaldo, Gareth Bale, Karim Benzema. Cristiano Ronaldo next game will be in La Liga against Eibar, on the 11th of April of 2015. You can watch Juventus live stream, Real Madrid vs Eibar, Sevilla vs Barcelona, Manchester United vs Manchester City, Burnley vs Arsenal, and Bayern Munich vs Eintracht Frankfurt, all matches provided from our live streaming section.